Violin Fairy Daisy, Fairy Breena and Red Squirrel are enchanting complements to this massive Ancient Tree. Arrange them in a variety of ways to bring out the natural beauty and wonder of your miniature fairy garden, house plants or flower pots. All four pieces of this set can be moved independently of the others according to your liking. Pretty enough to decorate your container garden and indoor terrarium, our lawn decorations are strong and durable enough to withstand the elements in your backyard garden. Each piece of your new set is exclusively designed by Joykick, painted by one of our artists on high-quality polyresin and then given a protective coating of waterproof sealant. 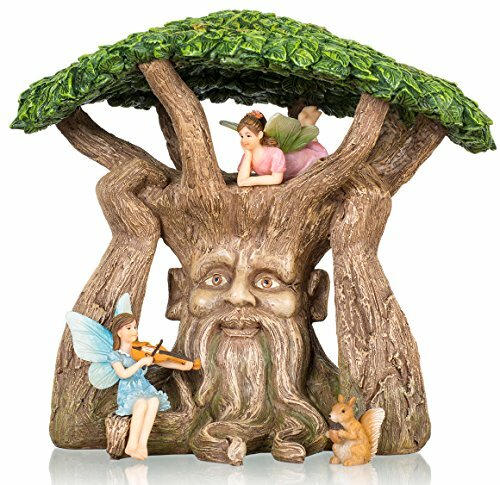 Your Fairy Garden Ancient Tree Kit will last for years outdoors or indoors. Joykick has created several miniature fairy garden kits for the garden and home that you can combine to come up with countless scenes to transform your garden from ordinary to magical. You'll love how they enhance the look and feel of any space they inhabit. Your children and grandkids will squeal with pleasure whenever they explore your miniature fairy garden. While this Fairy Garden Ancient Tree Kit is crafted from durable polyresin, we don't take any chances with our fairy garden supplies when it comes to shipping. We carefully pack all miniature fairies and other fairy garden accessories individually in styrofoam, we always bubble-wrap and slip them into a polybag before finally packing them into their boxes. MASSIVE GARDEN CENTERPIECE -- Unlike any other fairy tree, your head-turning 7.6x8.1x6.5" garden tree is unmissable. The intricate details including the carved face on the Ancient Tree and crown design are sure to wow your guests and fellow fairy enthusiasts. HAND PAINTED -- Each set is hand painted for intricate details and finishes. Your chance to own a high quality fairy ornaments exclusively designed by Joykick. Perfect for beautifying your garden with a sense of wonder. BUILT TO LAST -- Made with durable, designer quality polyresin and finished with a protective waterproof coating. Each item is individually wrapped and packaged securely using bubble wrap to ensure that they arrive in pristine condition. MIX AND MATCH -- All individual pieces can be moved to your liking and combined with other Joykick fairy garden kits, so you can create your own unique fairy paradise. PERFECT GIFT FOR FAIRY LOVERS -- Whether it's for your children, grandchildren, wife, mother or friends, this kit is a truly special gift for any occasion. Suitable for indoor or outdoor garden and looks great on the lawn, in a flowerpot or under a tree. If you have any questions about this product by Joykick, contact us by completing and submitting the form below. If you are looking for a specif part number, please include it with your message.